Photography has helped people around the world comprehend – or at the very least, pay attention to – the situation in Syria. Shots of cities in ruins, refugees in despair and, of course, those photos of little Alan Kurdi, dead at the age of three on a beach, have woken the world up to the catastrophic situation. Paul Crawford knows that beyond photojournalism, art can also play a significant role in fostering global understanding and empathy. Crawford is director/curator of the Penticton Art Gallery where, right now, the Syrian civil war and its calamitous consequences come alive in the summer exhibition Behind the Lines: Contemporary Syrian Art. 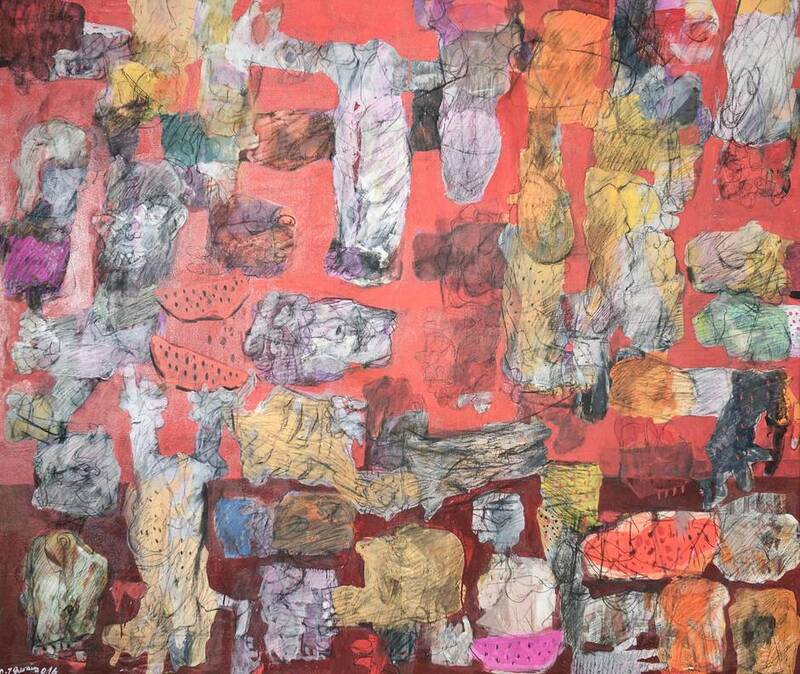 The show features more than 100 works by 19 artists, most of them young and emerging. Thirteen of the artists are still living and working in Syria as the fighting rages. The project was born out of last summer’s Kabul Art Project at the gallery, which featured work by contemporary artists from Afghanistan. Recognizing the relevance of the exhibition and the interest and dialogue it generated, Crawford started thinking about exploring other conflict zones through their art. He found Humam Alsalim’s online gallery of Syrian art, the two connected online and the planning began last summer. Alsalim, 24, who is studying architecture in Damascus, co-curated the show, recommending nearly all of the artists for the exhibition, sending images and websites to Crawford to consider. The works all reference the devastating situation or are informed by it. 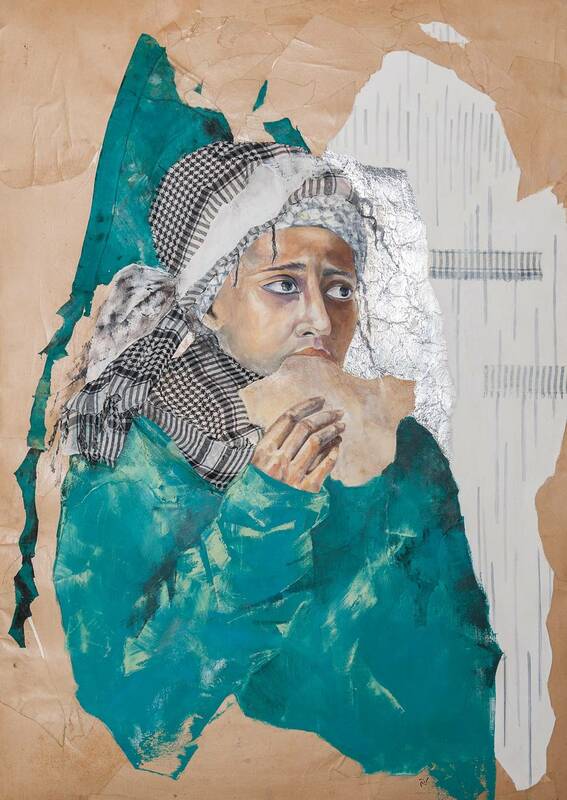 The body parts in Omran Younis’s paintings are a graphic reminder of the horrors of war. The sorrow in Lina Malki’s Displaced series is palpable. 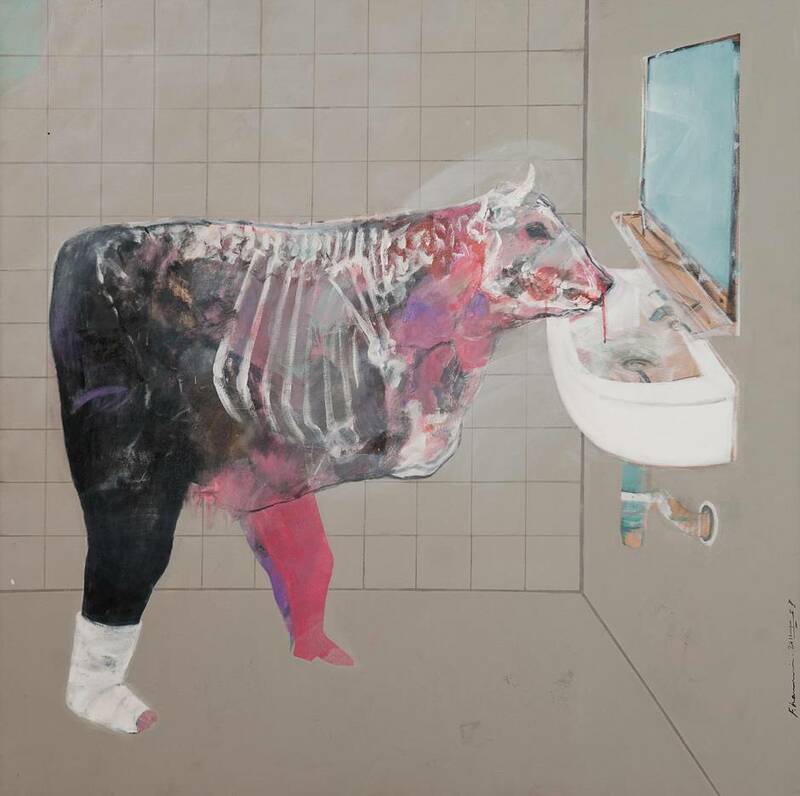 Fadi al-Hamwi’s large paintings of X-rayed cows speak to brutal animal instincts – and how war provokes and exposes the dark side of humanity. 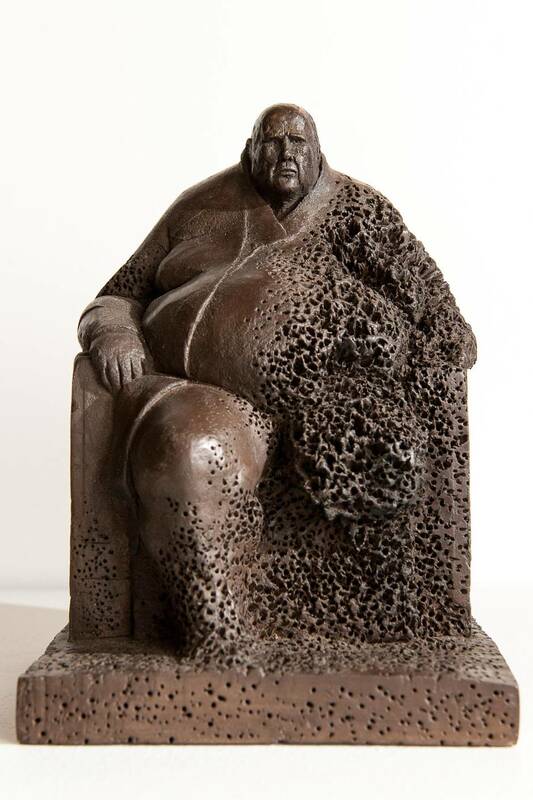 Khaled Dawwa’s clay sculptures – large but tortured men partly eaten away – are informed by his own experience: He was injured in a 2013 bombing, then arrested and imprisoned, according to the gallery. Refusing military service, he fled Syria for Lebanon, where he spent a year in hiding. He now lives in exile in France. Alsalim’s work is also in the show. 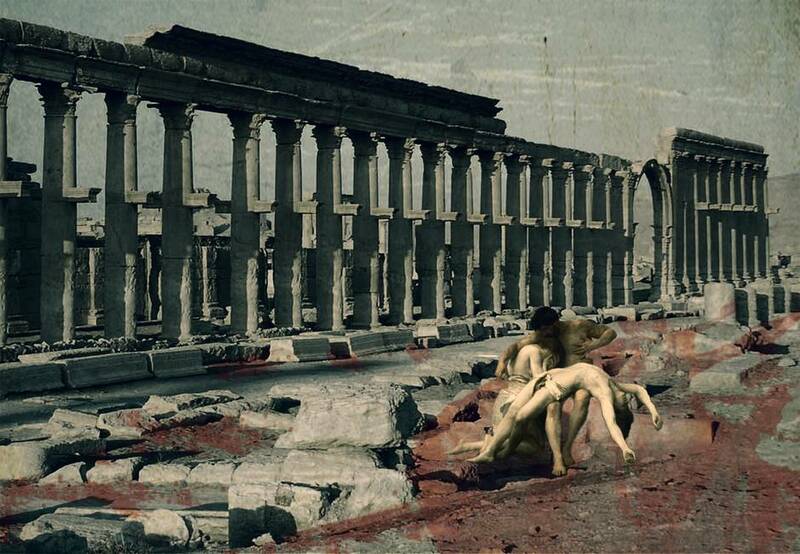 His Cultural Beheading series, created in 2015 (some with fellow artist Rami Bakhos) are digital prints, which mourn and rage against the destruction – both literal (destroyed artifacts, beheaded human beings) and metaphorical. The series was meant to raise awareness, Alsalim explains. The artists come from places familiar from news reports: Aleppo, Homs. Many are now in Damascus. Some have left Syria altogether. One, Khaled Youssef, lives in Nice – just metres away from the Bastille Day attack. A physician, he sheltered about 20 people who needed a place to stay in the chaotic aftermath. Yousseff’s photographic works are themselves dream-like; he depicts various cities – including Nice – “through the lens of a bubble,” as they are called. Putting Behind the Lines together has had its challenges. All of Crawford’s dealings with Alsalim have been online – through Facebook, e-mail and Skype; they have never met in person. At one point, Alsalim had to travel over land to Beirut so Crawford could wire him money; for shipping he needed $4,000 (U.S.), which could not be wired to Syria. Alsalim had a tiny window of opportunity to get there, Crawford scrambled to get the money (about $5,000 Canadian) together, wired it, and heard back from Alsalim that he had received the money and that he was having the time of his life in Beirut. Then Crawford heard nothing for days. Also crazy – about 20 of the works, held up in customs, didn’t arrive until late in the afternoon on the day before the exhibition opened. That meant a very late night preparing the works and installing the show. The reaction from visitors has been tremendous, Crawford reports. The works are all for sale – highly unusual for the public gallery, but Crawford wanted to do what he could to help the artists. Prices range from $1,000 (U.S.) to $5,000. Contact information has been included with the works so viewers can engage in a dialogue about the work – and beyond. Behind the Lines: Contemporary Syrian Art is at the Penticton Art Gallery until Sept. 11.